For this recipe, you need to start by cooking one medium-size sweet potato. While the microwave is certainly an option in a rush, I roasted it the way I normally do - in a 350 degree oven for about 45 minutes, or until the sweet potato is soft throughout. You can take care of this ahead of time and roast the sweet potato the day before since it needs to be chilled. I'd say you're looking for about a cup of sweet potato, mashed. Whisk it together with 2 tablespoons of light brown sugar and then, 3/4 cup of cold buttermilk. I cut a stick of cold butter into the flour and other dry ingredients and then stir in the sweet potato mixture. Here's the hard part for me! As we all knows, sometimes the cooking/baking process isn't as pretty as the finished picture! It's my messy reality! I pat the dough together best I could. It was crumbly and I am not confident about it but press on. I use a 2 1/2 inch round to cut out circles. I only managed to cut out 8 (reusing scrapes once) and boy, I was just relieved to get so far. Instead of brushing the tops of the biscuits with heavy cream, I simply used some more buttermilk that I'd already used for the biscuits themselves. The biscuits may not turn out as golden but it eliminates waste when you don't have extra cream on hand. We ate 4 of these and I froze the rest for another day. You can never stock your freezer enough! Roast sweet potato: Scrub and pat sweet potato dry. Prick the surface with a fork and wrap in aluminum foil. Place on a baking sheet in the oven and set oven temperature to 350 degrees. Bake until soft throughout, about 45 minutes to an hour. Let sweet potato cool, then remove the flesh and place in a bowl. Mash the sweet potato until smooth, then set it in the refrigerator for at least 1 hour to cool. Preheat oven to 425 degrees to bake biscuits. Whisk the cold sweet potato puree together with the brown sugar. Whisk in the buttermilk. In a large bowl, whisk the flour, baking powder, baking soda, and salt together. Add butter pieces and cut them into the flour mixture using a pastry cutter or your fingers until the mixture resembles coarse meal, with a few larger bits of butter (the size of large peas) remaining. Stir in the sweet potato mixture with a fork and mix gently until a soft dough forms. Turn the dough out onto a lightly floured surface. Pat dough into a 1-inch thick round. Cut out biscuits with a round cutter (I used a 2 1/2 inch size) and place onto a parchment-lined baking sheet, about an inch apart. Brush the tops of the biscuits with cream or buttermilk. Bake until golden brown, about 15 minutes. Remove from the oven and serve while still warm. 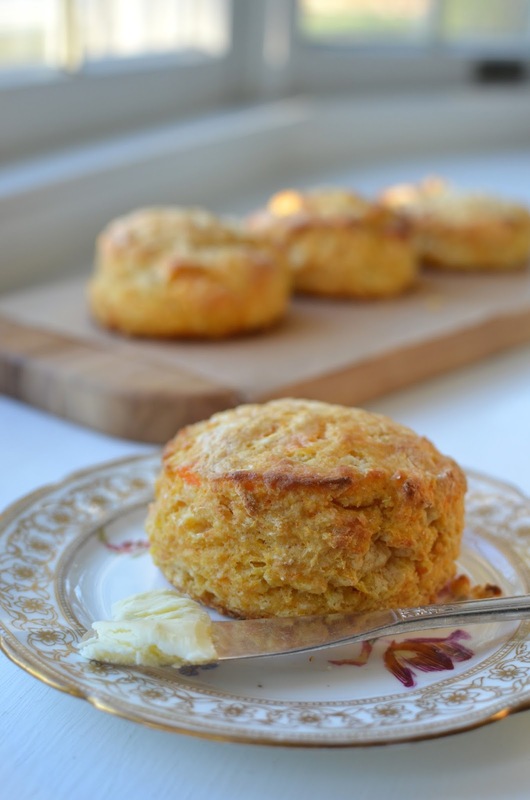 These biscuits look literally melt-in-mouth and ever so scrumptious, Monica. Thanks, Angie. I might bake the rest up this weekend. Things tucked in the freezer don't stay there too long, do they? As you already know, I am obsessed with anything with sweet potato!!! haha These biscuits sound fantastic! Have a wonderful wonderful weekend Monica! Yes, my fellow sweet potato lover! : ) They are so good!! Thanks, Anu. I like the color and the little sweetness. I am always roasting sweet potatoes anyway so it's no big deal. Oh cinnamon butter sounds so smart and perfect, Medha!! These sound fabulous! I'm such a fan of sweet potatoes, and love every way I cook or bake them. I've got a couple roasting in the oven right now - there may be some sweet potato biscuits in my future! I roasted 2 tonight and had some for my lunch today. Go through so many of them each week! How delicious! I could eat these all day. I really need to make biscuits more often, that would make my family so happy. Wishing you a super weekend! Biscuits are one of those things you bite into and you remember why everyone loves a biscuit! We had some with breakfast this morning! Thanks, Marcela. Enjoy your week! This looks so fabulous, easy and delicious! Biscuits are easy to eat, for sure! Have a good week! How did I miss these? 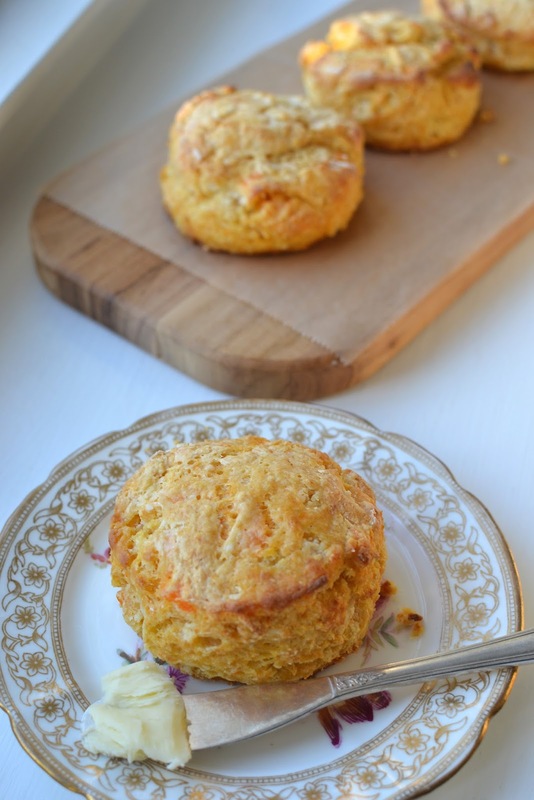 I am such a fan of sweet potatoes but have never tried a sweet potato biscuit - love the way they look and they sound fabulous. Biscuits are a personal favorite anyway so these are speaking to me! Hope you had a nice warm weekend. Happy Monday Monica! When I'm fumbling and trying to get the dough to come together to cut out the biscuits, I could really use an expert like you next to me telling me what to do!! Tricia - these would be a breeze for you. Thanks and have a wonderful week! Hi Monica, the way you described these makes me want to run out to my kitchen and bake these right now. It's cold and cloudy today, perfect biscuit weather. Lots of love for sweet potatoes! They are amazing and so satisfying. Your sweet potato bakes sound wonderful. I love sweet potato and this one is must try! Looks super delicious and beautiful!Bookmarked! They look and sound fabulous. I am with you on biscuit baking Monica, always worry how it will hold together. Yours looks perfect, crunchy and just sweet. I need make these sometime, craving it now. Have a beautiful week my dear. I'm sure biscuit making is a lot easier for you than it is for me, Asha! I'm always afraid to overwork it and then I think the recipe writer is holding out on me when it comes to the amount of liquid ingredients! But somehow, it works and you get those crunchy bits and flaky texture as a reward. Thanks for stopping by...take care! I am in love with these biscuits. I have everything I need in the house, I think I am making them tomorrow to eat them with soup. Glad they call out to you, too, Adina. I'd love to know how yours turn out and if you like it if you do get a chance to make some. Have a great one!